The first lifesaving societies had to overcome the superstition that it is unlucky to rescue and revive a drowned person. 1776 The Amsterdam Rescue Society was formed and placed fireplace bellows at intervals along Amsterdam’s canals, so people could resuscitate victims pulled from the water during/after drowning. In 1789, the Massachusetts Humane Society began building refuge houses along the Massachusetts coast for shipwreck survivors. took up too much room and the navy did not want sailors to swim, in case they decided to desert. In 1807, the the Massachusetts Humane Society set up the nation’s first lifeboat station on Cape Cod. 1852 Congress passed a law that lifejackets, or a float or lifepreserver be required on river passenger steamboats for each passenger. April 20, 1861, Clara Barton, the “Angel of the Battlefield,” began aid to servicemen in the U.S. Civil War. Henry Dunant, a Swiss businessman, having witnessed the wounded left to die alone after the Battle of Solferino, (40,000 men were killed or wounded in a single day), wrote a booklet, A Memory of Solferino, published in 1862, in which he proposed that the States should “formulate some international principle, sanctioned by a convention, inviolate in character, which, once approved and ratified, might serve as the basis for societies for the relief of the wounded” and in which he appealed for relief societies to be formed in the peacetime with nurses who would be ready to care for the wounded in wartime. He also wanted these volunteers to be recognized and protected through an international agreement. Thus the “International Committee for Relief to the Wounded”, which later became the International Committee of the Red Cross, was created. International feeling against the absence of care for war wounded, grew and the First Geneva Convention convened in 1864. The resulting Treaty of Geneva (“for the Amelioration of the Wounded and Sick in Armed Forces and Field’), thr first treaty of international humanitarian law, was signed by 12 European nations, but not by Great Britain, Saxony, Sweden, or the United States. The treaty signers agreed that in future wars they would care for all sick and wounded military personnel, regardless of nationality. They would also recognize the neutrality of medical personnel, hospitals and ambulances identified by the emblem of a red cross on a white background. This First Convention applied to wounded and sick members of the armed forces in the field. The Second Convention applied to wounded, sick, and shipwrecked members of the armed forces at sea as well as shipwreck victims. The Third Convention applied to prisoners of the war and the Fourth Convention applied to civilians in times of war. 1869 Bellevue hospital in New York is the first to actually put doctors on ambulances, along with supplies of bandages, tournquets, a quart of brandy, handcuffs and a straitjacket. Before then hearses were often used and the person deciding if the victim went to the hospital or the morgue was often a funeral director or mortician. Clara Barton, who heard about the International Red Cross movement while in Europe after the Civil war, founded the American Red Cross in Washington, D.C. on May 21, 1881. Clara Barton also worked for United States ratification of the first Geneva Convention. On March 1, 1882, President Chester A. Arthur signed the treaty. The Senate ratified it on March 16, 1882 and the United States became the 32nd nation to sign the document. ” No one should employ the more spectacular forms of rescue, if less perilous methods may be used just as effectively. 1903 English doctor E Sharpey Schafer invented a method of prone pressure artificial respiration. 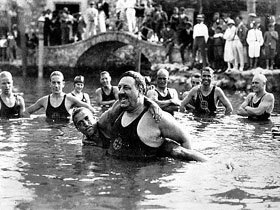 1908 George Douglas Freeth established the first lifeguard training at Redondo Beach, California. He retired at 62 and continued to swim in the ocean daily until he died on July 12, 1974. Flags in Texas were flown at half staff upon his death and a plaque was erected on the Galveston beach he patrolled for forty years. 1914 Former journalist Wilbert E Longfellow helped start Red Cross water safety instruction and the Red Cross Life Saving Corps to combat the climbing number of drownings. His main objective was to organize local volunteers into lifesaving corps. The lifesaving service required that a candidate be able to swim 50 feet. Six cardiologists founded the American Heart Association in 1924. When Duke Paoa Kahanamoku of Hawaii (1890 – 1968), the father of surfing, inventor of the rescue board, six time Olympic gold medalist and winner of the Olympic 100 meter race in 1912 and 1920, using a six-beat kick, with his size 13 feet, was asked who taught him the crawl stroke, he said “no one.” He had been swimming a stroke he saw older natives of his island swim. He kept his records until he was 34, when 20 year old Johnny Weissmuller (who eventually set 51 world records and became Tarzan of the movies) beat him in the 1924 Paris Olympics. 1930 the first use of the motto of Royal Life Saving Society Canada: Quemcunque Miserum Videris Hominem Scias…Whomsoever you see in distress, recognize in him a fellow man. 1935 Santa Monica, California, lifeguard Pete Peterson builds an inflatable yellow rescue tube with a snap hook at one end and a 14 inch strap, line and harness at the other end. He also created paddle boards for lifeguards and was the first person to paddle from Catalina to the mainland. He won the Pacific Coast Surfing Championship 4 times out of ten. During WW ll, 1939 to 1945, the Red Cross started a national blood program that collected 13.3 million pints of blood for armed forces. 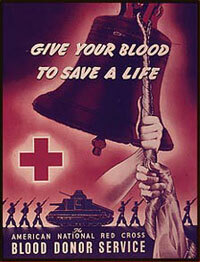 After the war the Red Cross started the first nationwide civilian blood program. The Colorado Mountain Club starts a technical climbing school with mountaineering first aid lessons. 1949 James Elam, and anesthesiologist, who had been reading historical accounts of new borns being resuscitated with mouth to mouth breathing, tried during a hopspital emergency to inflate the lungs of a young boy and it worked. Dr. Peter Safar, known as the Father of CPR, says the seeds were sown for the A (airway) and B (breathing) steps of CPR during a two-day car trip in October 1956, returning from a medical convention and talking shop with Dr. James Elam (see 1949). In the late 1950s Safar worked with Martin McMahon, chief of the Baltimore Fire Department ambulance service to design the first modern ambulance. At that time ill people were taken to hospitals in station wagons (or even hearses), with no care given on the way. Safar and McMahon designed an ambulance as we know it today, with a large compartment for a patient bed and seating for an attendant who could give oxygen and had equipment at hand to insert airways. In 1960 the Royal Lifesaving Society is the first to teach mouth-to-mouth, direct contact resuscitation instead of methods which use back pressure or arm lifts. 1960 Dr. Peter Safar approached Norwegian toymaker Asmund Laerdal to develop a realistic life-sized mannequin for teaching mouth-to-mouth resuscitation. The manikin’s face was inspired by a death mask, owned by Laerdal, of a girl who drowned herself in the Seine River. He wrote to U.S. presidents with his opinion on world problems (as well as science), including the U.S. war with Iraq. He helped found Physicians for Social Responsibility and the International Physicians for the Prevention of Nuclear War. See Peter’s Laws for the Navigation of Life, quoted at the bottom of this page. medical corpsmen, rapid transportation and advanced trauma care, a wounded soldier had more chance of survival than a serious motor vehicle accident victim in California. 1965 more deaths from motor vehicle accidents than lost in the Korean war. 1966— Accidental Death and Disability: The Neglected Disease of Modern Society is written, advising more research on trauma. Some say it revolutionized the way we view and manage trauma in the US. In 1967, a presidential commission on law enforcement recommended that a single phone number to be used across the country for fire, police and medical emergencies. Jan. 10, 1967 a newspaper helicopter was used to transfer a prematurely delivered infant from one hospital to another in Illinois. The baby was held in a small box on the lap of a Sister from the Third Order of Saint Francis. In 1968, A police station in Haleyville, Alabama is the first to use 9-1-1 as the three-digit number for fire, police and medical emergencies. The United Kingdom had first used a universal number (999) in 1937. In 1961 Australia used (111) and Canada used (999) in 1959. Supposedly 911 was chosen over 999 in the U.S. because it was easier/faster to dial on a rotary phone. In the late 70s a few other cities/counties had enhanced 911 systems. President Clinton signed Senate Bill 800 designating 911 as the nationwide number on October 16, 1999. At that time there were 20 different wireless numbers in different states. 1970 Military helicopters are used to move critically ill victims from remote areas to hospitals. Pilots included Vietnam veterans, a few of whom showed off their flying skills by flying under bridges and buzzing neighborhood swimming pools. 1990 The Lancet reports that in 1990 worldwide death by drowning (504,000) was more common than death through war (502,000). July 29, 1991 112 becomes the emergency number for the European Union, from Iceland to Turkey. 1992 American Red Cross booklet Waddles Presents Aquacktic Safety tells the tale of a duck character, Waddles, going to his first swim lesson. His instructor is a pink Flamingo named Miss Pink, and the lifeguard is a gorilla whose rescue tube is hanging on the wall, not with him as he sits in the stand. A 1994 study, one of the largest of it’s kind, found that less than 2 percent of New Yorkers with out-of-the-hospital heart attacks survived. Guy Lombardi, who started as one of the New York Fire Department’s (NYFD) first paramedics, went on to become a doctor and eventually a FDNY physician, is credited with using this research he co-authored as a catalyst for allowing not only paramedics, but also police officers, to be trained to use defibrillators. 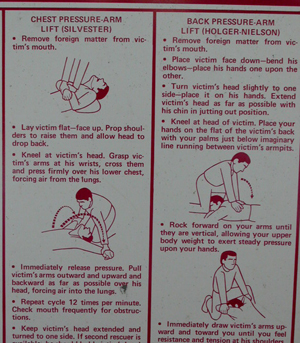 1999 The Red Cross includes automated external defibrillator (AED) training in CPR courses. 2001 QuikClot, a granulated mineral coagulant was developed, used by the U.S. military to treat serious wounds. Global positioning systems are first used in ambulances, sometimes leading them off course and causing them to arrive minutes or even hours late. 12% in rivers (28% between the age of 25 and 44). Of the 781 drownings, 41% were fatal. from the Coast guard: in 2004, States and jurisdictions reported a total of 12,781,476 registered recreational boats compared to 12,794,616 in 2003. The 4,904 boating accidents reported in 2004 resulted in 676 fatalities, 3,363 injuries, and $35,038,306 in property damage. Approximately 70% of all reported fatalities occurred on boats where the operator had not received boating safety instruction. In 2004, there were 3,308 unintentional fatal drownings in the United States, averaging nine people per day. This figure does not include the 676 fatalities, from drowning and other causes, due to boating-related incidents (CDC 2006; USCG 2006). For every child 14 years and younger who died from drowning in 2004, five received emergency department care for nonfatal submersion injuries. (CDC 2006). Access Cardiosystems, Inc. issued a Worldwide Recall of its AEDs in November 2004 due to the “ON/OFF” button and the shock delivery ciruit failing to function as well as the AED possibly turning on suddenly. Circa 2005 cell phones are used by EMTs/Paramedics in ambulances to transmit patient’s EKG readings more quickly to doctors in the emergency room, great except for dropped calls. For every minute that slips by without defibrillation, the victim’s chance of survival falls by about 10 percent. See also:Do AEDs work? May 28, 2007 Heavy surf broke the usual sandbars at beaches in Florida and hundreds of swimmers were rescued at one beach between noon and 3 p.m., before the beach was closed. In 2008 there were 50 drowning deaths in all of Australia, but in Bangladesh 50 children drowned each day of the year. This is not just due to the larger population in Bangladesh, the rate was 21 times higher there than in Australia. Drownings occur in natural bodies of water, in rice farming, where livestock are being watered in the family compound and in large cooking vessels. An April 2011 Red Cross survey found that about a third of adults do not realize that close supervision — staying within arm’s reach — is safer than putting floaties or water wings on a small child in a pool. 2015 The American heart Assn. reports that laypersons should be trained in hands-only (compressions only, no rescue breathing) CPR, as well as full CPR. 2017 Because of better sound insulation in cars, crashes involving drivers who didn’t hear sirens are becoming more common. Swedish ambulances are experimenting with technology to interrupt radio transmissions on the FM band with a warning that they are approaching, giving motorists more time to get out of the way. “Canadian Red Cross’ ongoing surveillance of unintentional water-related fatalities tracked 398 snowmobile-related deaths over a period of 20 years and found that snowmobile immersion deaths were largely preventable. The major risk group for snowmobile immersion deaths was 15- to 44-year-old males, with the largest number of deaths occurring among 25- to 34-year-olds. Snowmobiling immersion incidents occurred while riders were travelling on ice, going off-road or off bridges, and 59% of incidents occurred on lakes. Alcohol was present or suspected for 58% of fatalities 15 years of age and older (blood alcohol content was above the legal limit for 37%, below the limit for 12%, and suspected for 9%). Only 3% of people who died in snowmobiling incidents were properly wearing a flotation device such as a lifejacket or survival suit. Other immersion deaths involving motor vehicles on ice include ATV’s and ice fishing using a road vehicle. 1. If anything can go wrong, fix it! 4. Start at the top and work your way up. 5. Do it by the book… but be the author. 7. If you can’t beat them, join them, and then beat them. 8. If it’s worth doing, it’s got to be done now! 16. When in doubt, THINK! 19. The faster you move, the slower time passes, the longer you live! 21: When on thin ice, dance.